Email campaigns are still one of the most effective ways to increase revenue, gain leads to further market to, and share ideas with current customers. The challenge is how to increase email click-through rates, while also implementing the same marketing methods and success that your competition is having. One of the best ways to accomplish this, is simply by analyzing what your competition is doing, while also taking a look at some of the best email marketing case studies and resource guides in the market today. To make this process easier for you, we’ve documented ten excellent email marketing resources focused on how to increase email click-through rates. 1. 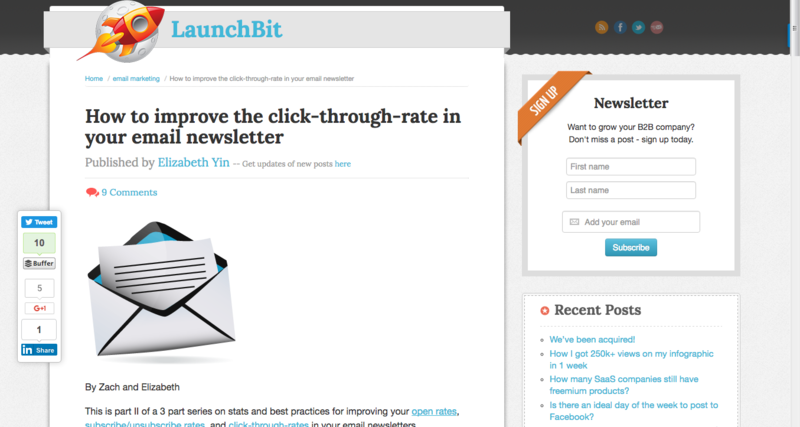 CrazyEgg.com – Crazy Egg published this comprehensive blog post about how to increase your click-through rates. Some of the tips they mention are to include bulleted lists of tips, asking questions, being clever and creative, and many other useful ideas. 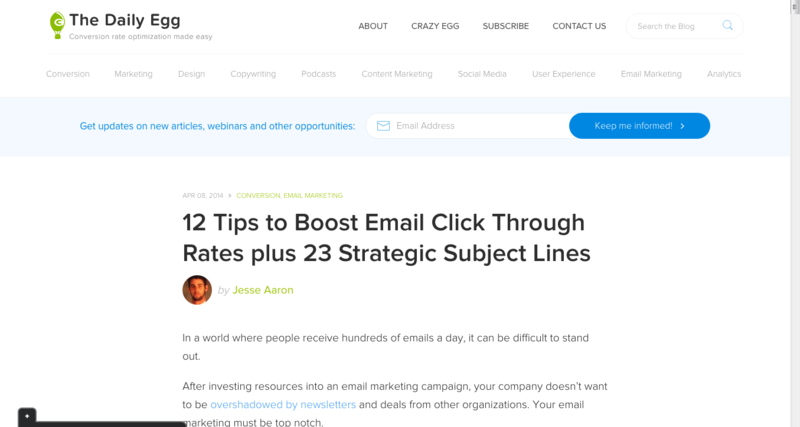 Check out their guide by clicking the link above and see if you can use any of these helpful tips in your email marketing campaigns. 2. 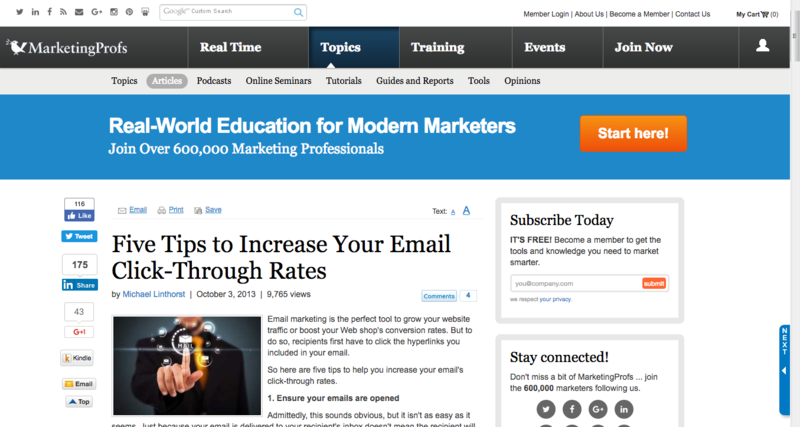 Marketingprofs.com – This site offers a nifty guide on how to streamline your efforts in your email campaigns so that people will be sure to open it and click through to your sales page. 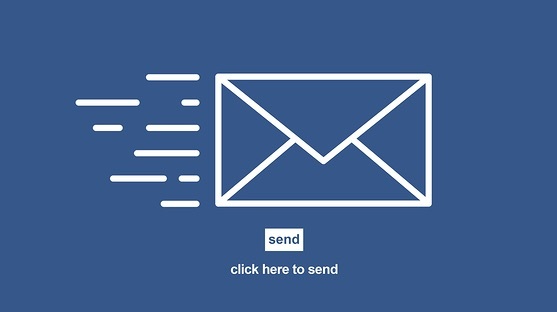 How do you get people to open your email? One suggestion they offer in this post is to create an interesting opt-in that people will respond to. Identify yourself to let people know who you are and why you are writing. You want to avoid sounding too “spammy” and focus on the reason you are creating the email in the first place. Don’t waste anyone’s time by including extremely long descriptions or explanations within the email. If you have long descriptive text, save it for your landing page that you send them to. They also remind you to stay relevant to the niche area that your prospect works in so that they will feel compelled to follow through. 3. Campaign Monitor – This guide by The Campaign Monitor takes a psychological view about email campaigns and came up with some great tips on how to increase click-through rates that appeal to a person’s psychological being. One suggestion is that you invoke curiosity in the reader which appeals to the need to get past a sense of “unrest.” They offer other tips about such as catering to the ego and showing “social proof” as other ways to draw the target audience and get them to act. Read the entire post to find out more. 4. 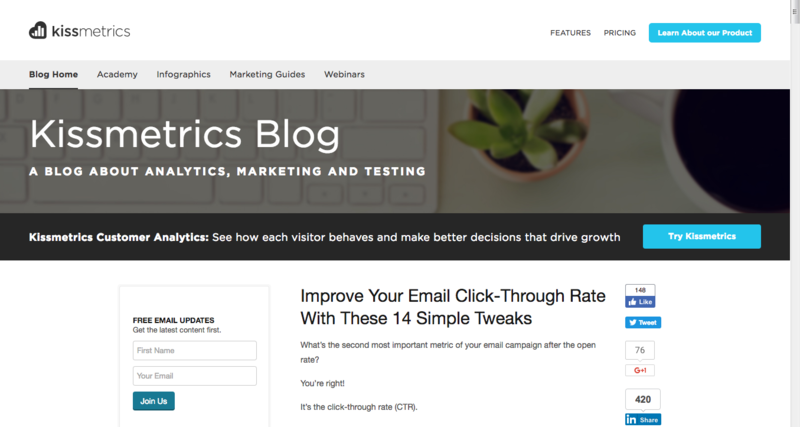 Kissmetrics – Kissmetrics, the company is known for helping you maximize your impact on the internet, has developed several tips in this online blog post that will help you increase your click-through rates and improve your ROI. Their first tip is to use your branding as one of the most important aspects that people notice when they come onto your page. 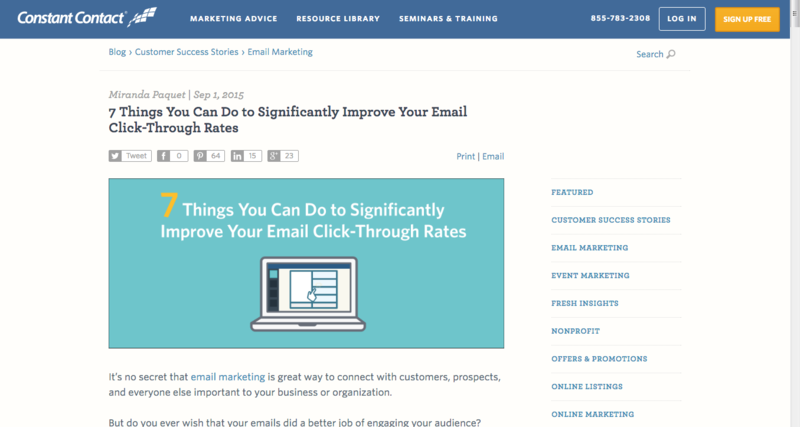 Kissmetrics suggests that you should focus on making your website and brand consistent with your email campaigns. This will help with your branding and will also encourage click-through rates. Other suggestions they offer are to have a focused format that draws the eye to the center of the email and is not cluttered with too much text. They also remind you to be careful to include content that will be easily viewable on mobile devices in different formats and sizes. 5. 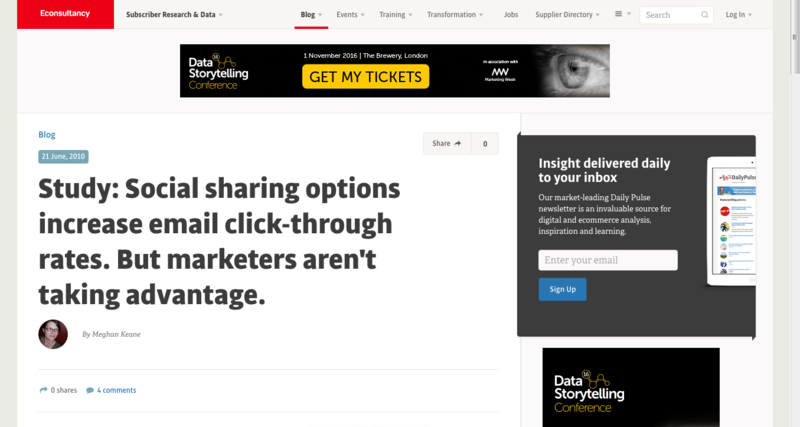 Econsultancy.com – This resource has a great group of suggestions and tips on how to increase your click-through rate by using social sharing options to engage your readers. This guide not only suggests including social media sharing options but that you should have at least three ways to share within the email. They also suggest including “share” buttons within the email that are attractive and encourage people to follow through with the action. 6. 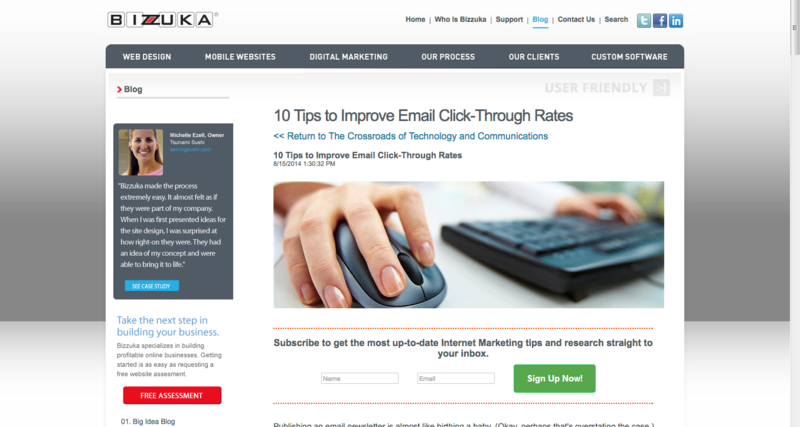 Bizzuka.com – This guide shows you how to get more people to open your email by having a recognizable title and sender name, and one that is not “spammy” or sales-oriented. They also suggest personalizing your message so that the person receiving it feels like you know them personally. Be friendly within your email and sound like you are genuinely interested in them. This guide also has a short infographic featuring a graph that illustrates some of the best times to send an email to increase your open rate. Read the full blog by clicking the link on number 6. 7. Constant Contact – Constant Contact published a great resource on how to increase click-through rates that focus on the level of engagement of your email campaign. They argue that, if your posts are just engaging enough and capture the attention of your intended audience, you will be able to get them to open your emails and react to what you are telling them. They mention in the post that your true click through rate may vary somewhat from those of your associates or other business owners because they vary in different types of businesses. However, you can measure your click-through rate using automated software that allows you to measure the ratio of opened emails to actual click-through rates over time. 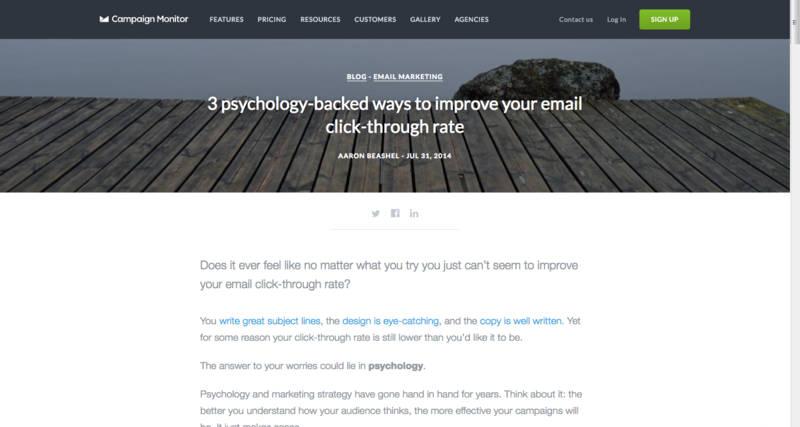 They go on to say in this post of tips on increasing your click-through rate that you should have an obvious goal in your emails so that people will know what you wish to achieve and what you want them to do. 8. 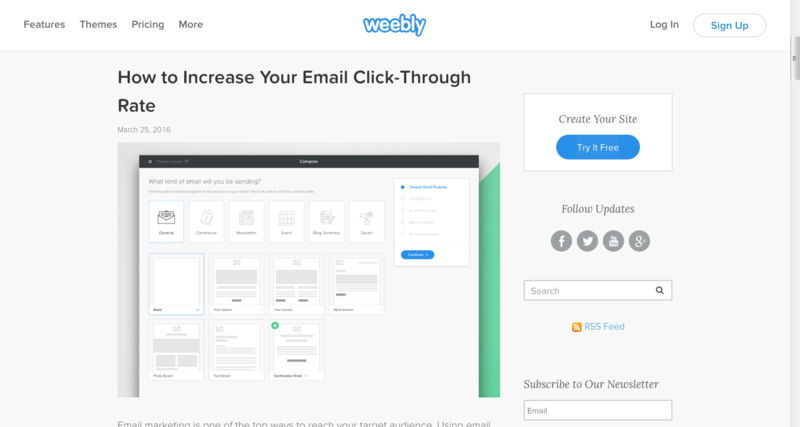 Weebly.com – Weebly, a company, known for creating websites and blogs and other tools for business owners online, mentions some hard and fast tips in their blog about how to increase click-through rates. One factor they mention is to pay attention to the design and the functionality of your emails. If the email is uncluttered with too many extra things and focuses on the best aspects of your brand, you are more likely to see results. They also recommend a “call-to-action” button and a short message asking them to do what you want them to do. 9. ProfitPursuits.com – This blog offers tips related to getting more clicks based on including relevant data and highly-targeted content within the email messages. They show some samples within the post to guide you as to how your email should look and suggest adding impressive graphics and other key elements that are more likely to draw attention to your message. They believe that using relevant data such as charts or graphs or even infographics can go a long way toward impressing the people you want to purchase your products or act on your email. 10. LaunchBit – This blog by LaunchBit includes some very valuable information and tips on how to increase your CTRs by using data to chart your results. They have some examples on their site that will give you an idea as to how your CTR rates should look as opposed to your “open rate.” The open rate should be high because you have to get them to open an email before they purchase. But the CTR should be the highest overall. Include a call-to-action to make sure customers know what to do to take it to the next step. Otherwise, your CTRs will be useless. In conclusion, use these tips to maximize your impact with your custom email campaigns by using data, compelling images and infographics, and many other tools that will draw attention to your reader’s eye. 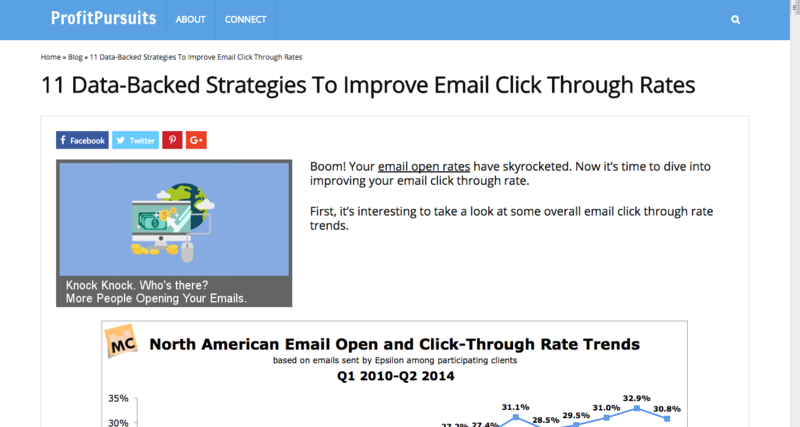 If you enjoyed this type of article and resource, also be sure to check out our resource article on how to improve email open rates. Remember, most of all; you should try to provide value to the customer or potential customer by creating a desirable outcome for them. Using techniques such as showing the final result, as well as how you are going to address their individual problems or make life better for them will go a long way toward winning their love. If you are currently managing or building a list of your own, be sure to contact AfterOffers.com to learn more about how we can double your daily subscriber growth through our partnership with more than 1,000 premium internet marketing and business resource sites.